Dell is celebrating the 20th anniversary of the Precision business workstation line with a cool "limited edition" Precision 5520, sporting new packaging, special wallpapers, and (most importantly) a cool dark anodized aluminum finish. The Precision 5520 is the slightly less well-known business brother of the consumer XPS 15. The first generation were nearly identical to each other (save for CPUs and Quadro GPU) but the XPS 15 9560 is more differentiated, as it packs a fingerprint scanner and a significantly more powerful GPU, the GTX 1050. Still, the Precision 5520 can be configured with i7-7820HQ or Xeon E3-1505M v6 CPUs, while the fastest CPU the XPS line gets is the i7-7700HQ. There might be another reason to pick the Precision 5520 now, though: a new limited "Anniversary Edition" run, complete with a new dark anodized aluminum finish. To celebrate 20 years of Precision workstations, Dell is now selling a limited-edition variant of their popular Precision 5520. The Dell Precision 5520 Anniversary Edition SKU features the UHD IGZO display, i7-7820HQ CPU (2.9-3.9 GHz), Quadro M1200, 8GB DDR4, and 256GB PCIe SSD. 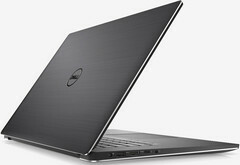 With Dell's included coupon, the price for this comes down to a significant US$2023.36. Is that worth it for the specs? Probably not, but Dell is counting on the design to sell itself. The already sleek appearance has been dialed-up with a new finish that Dell is calling "Abyss". The finish turns the classic silver anodized upper and lower shell of the chassis dark grey and applies a layer of anti-fingerprint coating. An optimistic look at the new finish is that Dell could be preparing new color options for the next update of the XPS and Precision line. It wouldn't be the first time Dell offered a colored variant on their XPS line (the XPS 13 had a gold option), but it would be the first time for the XPS 15/Precision 5520.